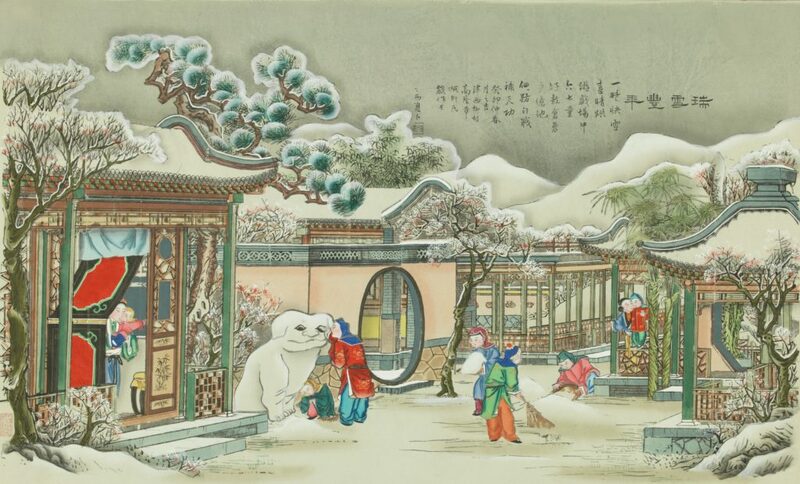 New Year paintings are an important part of the festive new year atmosphere – they embody a longing for happiness and the joy of the harvest for village folk. These idyllic paintings, which radiate joy and liveliness, are an indispensable part of Chinese culture. Ebullient with pure emotion and filled with imagination and creativity, they are close to man’s nature and the creators’ true self. These works are enlivened through art while deeply rooted in the ordinary. Yangliuqing’s New Year paintings are considered the ‘pinnacle of quality’ among New Year paintings, renowned for their exquisite carving, delicate colours, and diversity of styles. They were first produced in the mid to late Ming Dynasty, and flourished throughout the Qing Dynasty, when Yangliuqing had over 3,000 artists across 36 villages. Over time, there evolved a signature ‘Yangliuqing’ style, involving a unique combination of woodblock printing and painting – this technique preserved the flavour of traditional woodblock prints while incorporating the vibrancy of hand-painted colours. The contents of Yangliuqing New Year paintings are uplifting and positive; combined with bright colours, vivid images, expert craftsmanship and aesthetically pleasing compositions, the paintings exude their own alluring charm. To showcase traditional Chinese culture and strengthen artistic exchange between China and Singapore, The Parkview Museum Singapore has collaborated with the National Art Museum of China (NAMOC), and the China Cultural Centre, to present an exhibition of Yangliuqing New Year paintings from NAMOC’s extensive folk art collection. This exhibit displays over a hundred paintings from the Kangxi Period of Qing Dynasty to the Late Qing era, and showcases the styles, features, and themes of these joyous, festive artworks.